Among the Sioux chiefs of the "transition period" only one was shrewd enough to read coming events in their true light. It is said of Spotted Tail that he was rather a slow-moving boy, preferring in their various games and mimic battles to play the role of councilor, to plan and assign to the others their parts in the fray. This he did so cleverly that he soon became a leader among his youthful contemporaries; and withal he was apt at mimicry and impersonation, so that the other boys were accustomed to say of him, "He has his grandfather's wit and the wisdom of his grandmother!" Spotted Tail was an orphan, reared by his grandparents, and at an early age compelled to shift for himself. Thus he was somewhat at a disadvantage among the other boys; yet even this fact may have helped to develop in him courage and ingenuity. One little incident of his boy life, occurring at about his tenth year, is characteristic of the man. In the midst of a game, two boys became involved in a dispute which promised to be a serious one, as both drew knives. The young Spotted Tail instantly began to cry, "The Shoshones are upon us! To arms! to arms!" and the other boys joined in the war whoop. This distracted the attention of the combatants and ended the affair. Upon the whole, his boyhood is not so well remembered as is that of most of his leading contemporaries, probably because he had no parents to bring him frequently before the people, as was the custom with the wellborn, whose every step in their progress toward manhood was publicly announced at a feast given in their honor. It is known, however, that he began at an early age to carve out a position for himself. It is personal qualities alone that tell among our people, and the youthful Spotted Tail gained at every turn. At the age of seventeen, he had become a sure shot and a clever hunter; but, above all, he had already shown that he possessed a superior mind. He had come into contact with white people at the various trading posts, and according to his own story had made a careful study of the white man's habits and modes of thought, especially of his peculiar trait of economy and intense desire to accumulate property. He was accustomed to watch closely and listen attentively whenever any of this strange race had dealings with his people. When a council was held, and the other young men stood at a distance with their robes over their faces so as to avoid recognition, Spotted Tail always put himself in a position to hear all that was said on either side, and weighed all the arguments in his mind. The Utes were the attacking party and far outnumbered the Sioux on this occasion. Many of their bravest young men had fallen, and the Brules were face to face with utter annihilation, when Spotted Tail, with a handful of daring horsemen, dodged around the enemy's flank and fell upon them from the rear with so much spirit that they supposed that strong reinforcements had arrived, and retreated in confusion. The Sioux pursued on horseback; and it was in this pursuit that the noted chief Two Strike gained his historical name. But the chief honors of the fight belonged to Spotted Tail. The old chiefs, Conquering Bear and the rest, thanked him and at once made him a war chief. No sooner had the Oregon Trail been secured from the Sioux than Fort Laramie and other frontier posts were strengthened, and the soldiers became more insolent and overbearing than ever. It was soon discovered that the whites were prepared to violate most of the articles of their treaty as the Indians understood it. At this time, the presence of many Mormon emigrants on their way to the settlements in Utah and Wyoming added to the perils of the situation, as they constantly maneuvered for purposes of their own to bring about a clash between the soldiers and the Indians. Every summer there were storm-clouds blowing between these two�clouds usually taking their rise in some affair of the travelers along the trail. Thus Spotted Tail played an important part at the very outset of those events which were soon to overthrow the free life of his people. I do not know how far he foresaw what was to follow; but whether so conceived or not, his surrender was a master stroke, winning for him not only the admiration of his own people but the confidence and respect of the military. Thus suddenly he found himself in prison, a hostage for the good behavior of his followers. There were many rumors as to the punishment reserved for him; but luckily for Spotted Tail, the promises of General Harney to the Brule chiefs in respect to him were faithfully kept. One of his fellow-prisoners committed suicide, but the other held out bravely for the two-year term of his imprisonment. During the second year, it was well understood that neither of the men sought to escape, and they were given much freedom. It was fine schooling for Spotted Tail, that tireless observer of the ways of the white man! It is a fact that his engaging personal qualities won for him kindness and sympathy at the fort before the time came for his release. One day some Indian horse thieves of another tribe stampeded the horses and mules belonging to the garrison. Spotted Tail asked permission of the commanding officer to accompany the pursuers. That officer, trusting in the honor of a Sioux brave, gave him a fast horse and a good carbine, and said to him: "I depend upon you to guide my soldiers so that they may overtake the thieves and recapture the horses!" 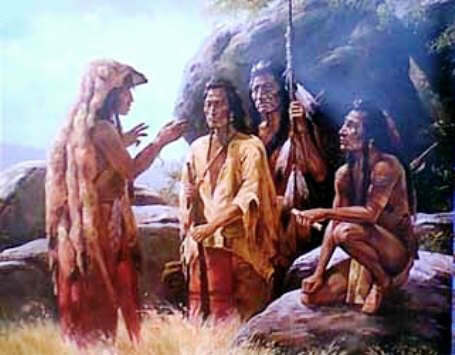 The soldiers recaptured the horses without any loss, but Spotted Tail still followed the Indians. When they returned to the fort without him, everybody agreed that he would never turn up. However, next day he did "turn up�, with the scalp of one of the marauders! Soon after this he was returned to his own people, who honored him by making him the successor of the old chief, Conquering Bear, whose blood he had avenged, for which act he had taken upon himself the full responsibility. He had made good use of his two years at the fort, and completed his studies of civilization to his own satisfaction. From this time on he was desirous of reconciling the Indian and the white man, thoroughly understanding the uselessness of opposition. He was accordingly in constant communication with the military; but the other chiefs did not understand his views and seem to have been suspicious of his motives. In 1860-1864 the Southern Cheyennes and Comanches were at war with the whites, and some of the Brules and Ogallalas, who were their neighbors and intimates, were suspected of complicity with the hostiles. Doubtless a few of their young men may have been involved; at any rate, Thunder Bear and Two Face, together with a few others who were roving with the warring tribes, purchased two captive white women and brought them to Fort Laramie. It was, however, reported at the post that these two men had maltreated the women while under their care. Of course, the commander demanded of Spotted Tail, then head chief, that he give up the guilty ones, and accordingly he had the two men arrested and delivered at the fort. At this there was an outcry among his own people; but he argued that if the charges were true, the men deserved punishment, and if false, they should be tried and cleared by process of law. The Indians never quite knew what evidence was produced at the court-martial, but at all events the two men were hanged, and as they had many influential connections, their relatives lost no time in fomenting trouble. The Sioux were then camping close by the fort and it was midwinter, which facts held them in check for a month or two; but as soon as spring came, they removed their camp across the river and rose in rebellion. A pitched battle was fought, in which the soldiers got the worst of it. Even the associate chief, Big Mouth, was against Spotted Tail, who was practically forced against his will and judgment to take up arms once more. At this juncture came the sudden and bloody uprising in the east among the Minnesota Sioux, and Sitting Bull's campaign in the north had begun in earnest; while to the south the Southern Cheyennes, Comanches, and Kiowas were all upon the warpath. Spotted Tail at about this time seems to have conceived the idea of uniting all the Rocky Mountain Indians in a great confederacy. He once said: "Our cause is as a child's cause, in comparison with the power of the white man, unless we can stop quarreling among ourselves and unite our energies for the common good." But old- time antagonisms were too strong; and he was probably held back also by his consciousness of the fact that the Indians called him "the white man's friend", while the military still had some faith in him which he did not care to lose. He was undoubtedly one of the brainiest and most brilliant Sioux who ever lived; and while he could not help being to a large extent in sympathy with the feeling of his race against the invader, yet he alone foresaw the inevitable outcome, and the problem as it presented itself to him was simply this: "What is the best policy to pursue in the existing situation?" Here is his speech as it has been given to me, delivered at the great council on the Powder River, just before the attack on Fort Phil Kearny. We can imagine that he threw all his wonderful tact and personal magnetism into this last effort at conciliation. "'Hay, hay, hay! Alas, alas!' Thus speaks the old man, when he knows that his former vigor and freedom is gone from him forever. So we may exclaim to-day, Alas! There is a time appointed to all things. Think for a moment how many multitudes of the animal tribes we ourselves have destroyed! Look upon the snow that appears to-day�to-morrow it is water! Listen to the dirge of the dry leaves, that were green and vigorous but a few moons before! We are a part of this life and it seems that our time is come. "Yet note how the decay of one nation invigorates another. This strange white man�consider him, his gifts are manifold! His tireless brain, his busy hand do wonders for his race. Those things which we despise he holds as treasures; yet he is so great and so flourishing that there must be some virtue and truth in his philosophy. I wish to say to you, my friends: Be not moved alone by heated arguments and thoughts of revenge! These are for the young. We are young no longer; let us think well, and give counsel as old men!" These words were greeted with an ominous silence. Not even the customary "How!" of assent followed the speech, and Sitting Bull immediately got up and replied in the celebrated harangue which will be introduced under his own name in another chapter. The situation was critical for Spotted Tail�the only man present to advocate submission to the stronger race whose ultimate supremacy he recognized as certain. The decision to attack Fort Phil Kearny was unanimous without him, and in order to hold his position among his tribesmen he joined in the charge. Several bullets passed through his war bonnet, and he was slightly wounded. When the commission of 1867-1868 was sent out to negotiate with the Sioux, Spotted Tail was ready to meet them, and eager to obtain for his people the very best terms that he could. He often puzzled and embarrassed them by his remarkable speeches, the pointed questions that he put, and his telling allusions to former negotiations. Meanwhile Red Cloud would not come into the council until after several deputations of Indians had been sent to him, and Sitting Bull did not come at all. The famous treaty was signed, and from this time on Spotted Tail never again took up arms against the whites. On the contrary, it was mainly attributed to his influence that the hostiles were subdued much sooner than might have been expected. He came into the reservation with his band, urged his young men to enlist as government scouts, and assisted materially in all negotiations. The hostile chiefs no longer influenced his action, and as soon as they had all been brought under military control, General Crook named Spotted Tail head chief of the Sioux, thus humiliating Red Cloud and arousing jealousy and ill-feeling among the Ogallalas. In order to avoid trouble, he prudently separated himself from the other bands, and moved to the new agency on Beaver Creek (Fort Sheridan, Nebraska), which was called "Spotted Tail Agency." Just before the daring war leader, Crazy Horse, surrendered to the military, he went down to the agency and roundly rebuked Spotted Tail for signing away the freedom of his people. From the point of view of the irreconcilables, the diplomatic chief was a "trimmer" and a traitor; and many of the Sioux have tried to implicate him in the conspiracy against Crazy Horse which led to his assassination, but I hold that the facts do not bear out this charge. The name of Spotted Tail was prominently before the people during the rest of his life. An obscure orphan, he had achieved distinction by his bravery and sagacity; but he copied the white politician too closely after he entered the reservation. He became a good manipulator, and was made conceited and overbearing by the attentions of the military and of the general public. Furthermore, there was an old feud in his immediate band which affected him closely. Against him for many years were the followers of Big Mouth, whom he had killed in a duel; and also a party led by a son and a nephew of the old chief, Conquering Bear, whom Spotted Tail had succeeded at his death. These two men had hoped that one or the other of them might obtain the succession. Crow Dog, the nephew of Conquering Bear, more than once taunted Spotted Tail with the fact that he was chief not by the will of the tribe, but by the help of the white soldiers, and told him that he would "keep a bullet for him" in case he ever disgraced his high position. Thus retribution lay in wait for him while at the height of his fame. Several high-handed actions of his at this time, including his elopement with another man's wife, increased his unpopularity with a large element of his own tribe. On the eve of the chief's departure for Washington, to negotiate (or so they suspected) for the sale of more of their land, Crow Dog took up his gun and fulfilled his threat, regarding himself, and regarded by his supporters, not as a murderer, but as an executioner. Such was the end of the man who may justly be called the Pontiac of the west. He possessed a remarkable mind and extraordinary foresight for an untutored savage; and yet he is the only one of our great men to be remembered with more honor by the white man, perhaps, than by his own people. This story of Spotted Tail is featured in the book entitled Indian Heroes and Great Chieftains by Charles A. Eastman which was published by Little, Brown and Company, Boston in 1918.